Since its initial public offering (IPO) 16 years ago, Enterprise Products Partners LP (NYSE: EPD) has been an outstanding investment. An investor who bought the stock at the close of the master limited partnership’s (MLP) first day of trading would have accumulated a total return of almost 2,000 percent. Over the same 16-year period, the S&P 500 posted a gain of 135 percent, while the S&P 500 Energy Index delivered a 460 percent total return. And Enterprise Products Partners has increased its distribution in 40 consecutive quarters, the epitome of consistency and even more impressive when you consider that this stretch includes the Great Recession. A $10,000 investment in the MLP on July 28, 1998, would now pay out almost $2,713 in annual distributions–a 27 percent annualized yield on the initial investment. Even better, an investor who put the same $10,000 into the stock in 1998 and reinvested the distribution would now receive almost $7,000 per year in total distributions, roughly equivalent to an annualized yield of about 70 percent on that initial stake. The strong performance of Enterprise Products Partners’ stock reflects the company’s forward-thinking management and high-quality asset base. The MLP has an uncanny knack at staying one step ahead of the rest of its competitors. In 2002, Enterprise Products Partners and other midstream MLPs suffered from a collapse in gas-processing margins. In the first six months of 2001, this business line generated more than $96.5 million in gross operating margin for Enterprise Products Partners, compared to a negative $34.6 million gross margin in the first half of 2002. The prices of key natural gas liquids (NGL) plummeted in late 2001 and early 2002. 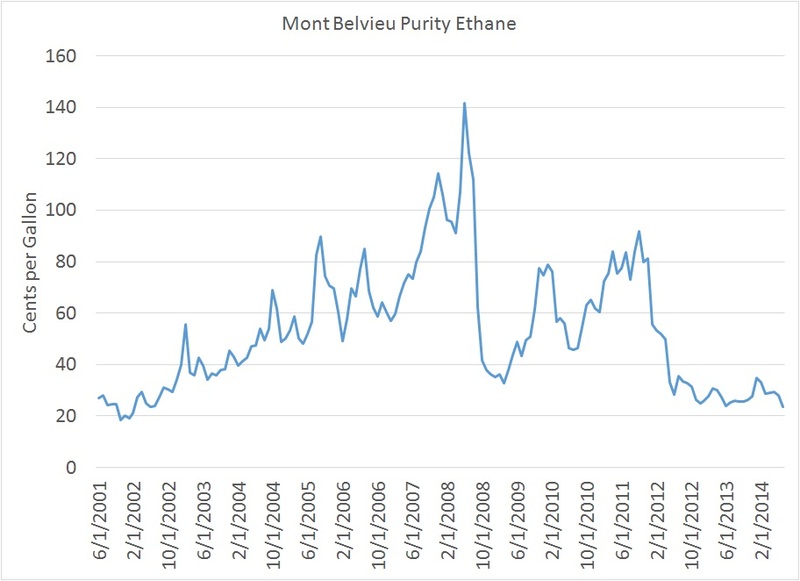 Ethane, for example, fell from an average of $0.49 per gallon in the first quarter of 2001 to $0.26 per gallon in the second quarter of 2002, while propane prices tumbled by more than a third from $0.63 per gallon to $0.40 per gallon. Enterprise Products Partners was one of the first midstream operators to transition away from keep-whole and percent-of-proceeds contracts in which the processor receives all or a portion of the extracted NGLs as compensation for its services. In both instances, declining NGL prices can saddle gas processors with significant losses. To improve the stability of its cash flow, Enterprise Products Partners began to seek fee-based contracts whereby the customer pays MLP a toll based on the volume of gas processed. Acquiring companies with existing fee-based processing contracts accelerated this transition. In the third quarter of 2003, Enterprise Products Partners restructured contracts covering about 10 percent of its processing capacity, converting these deals from keep-whole arrangements to fee-based agreements. Keep-whole arrangements accounted for 1 percent. As of the second quarter of 2014, fee-based agreements cover 43 percent of Enterprise Products Partners’ processing volumes, with another 19 percent under hybrid contracts that include a fee component. And management estimates that the blue-chip MLP generates about 85 percent of its overall gross operating margin from fee-based contracts, up from 75 percent two years ago. Enterprise Products Partners has continued to expand its asset base and grow its quarterly distribution while systematically reducing risk and its exposure to commodity prices. MLPs often consist of two entities: an operating limited partnership and a general partner that usually owns a 2 percent stake in the LP and receives IDRs as compensation for managing the operating partnership’s assets. IDRs entitle the general partner to a progressively larger share of the of the MLP’s cash flow as the limited partner increases its distributions to common unitholders. This tiered structure incentivizes the general partner to pursue strategies that enable the MLP to grow its payout over time. At the time of its IPO, Enterprise Products Partners’ partnership agreement included a typical IDR structure that entitled the privately held general partner to 50 percent of the MLP’s incremental cash flow when the quarterly distribution exceeded a certain level–in this case, $0.392 per unit (adjusted for the recent 2-for-1 stock split). On Dec. 17, 2002, Enterprise Products Partners’ general partner modified the partnership agreement, reducing its maximum IDR to 25 percent of the MLP’s incremental cash flow growth. This modification also shifted the tier structure itself so that the change didn’t immediately affect the total incentive distribution collected by the general partner. However, these adjustments enhanced the MLP’s growth prospects significantly. In 2010, Enterprise Products Partners eliminated its IDRs entirely by acquiring its general partner. Several prominent MLPs–including Buckeye Partners LP (NYSE: BPL), Genesis Energy LP (NYSE: GEL) and Magellan Midstream Partners LP (NYSE: MMP)–followed the leader and acquired their general partners. Check out this graph depicting the incremental cash flow necessary to support a 10 percent increase in Enterprise Products Partners’ quarterly distribution under the three IDR structures that the MLP has experienced since its IPO. 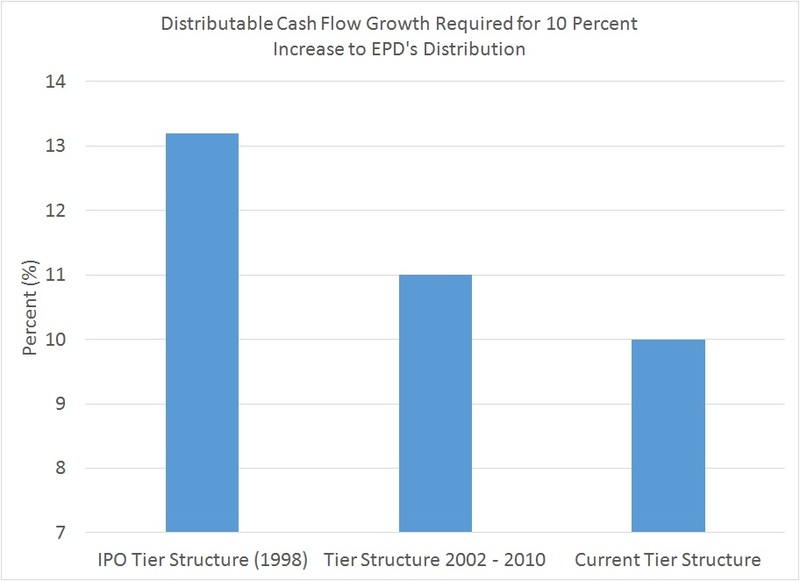 Today, a 10 percent increase in Enterprise Products Partners’ distributable cash flow can support an equivalent increase in its payout without affecting its coverage ratio. But under the IDR structure in force at the time of its IPO, the MLP would have needed to grow its distributable cash flow by 13.2 percent to raise its quarterly payout by 10 percent. In the early stages of an MLP’s existence, IDRs act as a powerful incentive for the GP to grow the MLP’s distributable cash flow at a rapid clip. Over the past three years, Enterprise Products Partners has focused its attention on building projects to support the most powerful trend under way in the energy industry today, North America’s shale oil and gas revolution and the push for US energy independence. The MLP’s management team quickly grasped that rapid production growth from US shale fields would result in a glut of certain hydrocarbons and the potential for significant energy exports. One example is ethane, the lightest and most common NGL, a group of hydrocarbons that are commonly produced alongside natural gas. Ethane is primarily used as a petrochemical feedstock to produce ethylene, a commodity chemical used to produce plastics and other synthetic materials. Many of the most prolific US shale oil and gas fields, including the Marcellus Shale in Appalachia and the Eagle Ford Shale in South Texas, contain significant volumes of ethane and other NGLs. With producers ramping up drilling activity in these liquids-rich plays, US ethane production has soared by about one-third over the past five years. 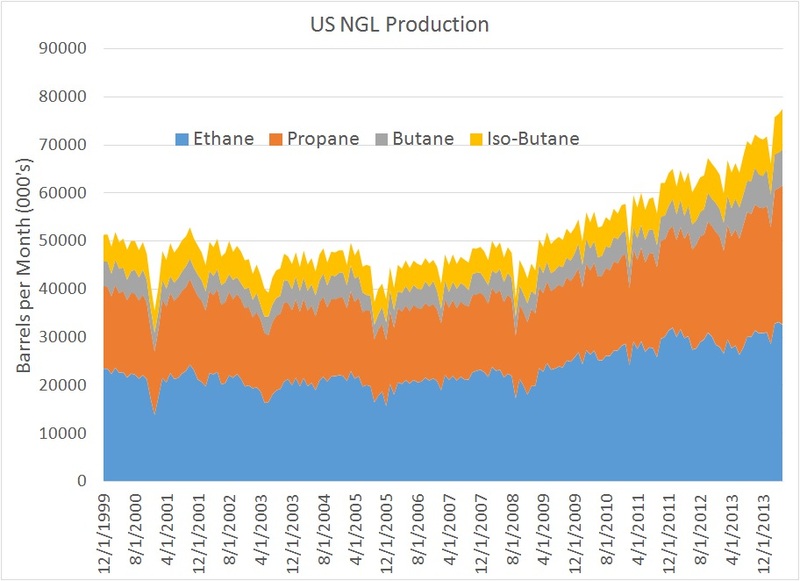 This glut of production has outstripped the domestic petrochemical industry’s capacity to process these volumes into ethylene, compressing ethane prices to less than $0.25 per gallon from about $0.80 per gallon at the end of 2011. But even before ethane prices collapsed to levels that encourage ethane rejection, Enterprise Products Partners began to discuss the potential construction of a world-class ethane export terminal on the US Gulf Coast. Management also noted that Enterprise Products Partners continues to field inquiries from potential customers and could announce an expansion to its ethane export project before long. As a first mover in exporting ethane, Enterprise Products Partners enjoys a significant advantage over potential copycat projects. As we explained in Betting on US LPG Exports, Enterprise Products Partners was also one of the first companies to develop significant capacity to export propane and butane from the US Gulf Coast. (Learn more about these commodities in NGL Price Update: The Lighter End of the Barrel and NGL Price Update: Butane and Isobutane). By the end of the first quarter of 2015, Enterprise Products Partners will expand its industry-leading export capacity by another 1.5 million barrels per month. And toward the end of next year, the MLP will expand its propane and butane export capacity by another 7 million barrels per month. All told, the partnership will have the capacity to export at least 16 million barrels of propane and butane per month under contracts that extend as far out as 2024, locking in a steady stream of cash flow. The US has prohibited crude-oil exports since the early 1970s, a response to the Arab Oil Embargos of that era. Exceptions to this ban include the re-export of oil imported from outside the US and limited shipments to Canada. Under the current structure, BIS can grant special export licenses and rule on the interpretation of the law. On this basis, the BIS issued separate PLRs permitting Enterprise Products Partners and Pioneer Natural Resources (NYSE: PXD), a leading oil and gas producer in the Permian Basin and the Eagle Ford Shale, to export minimally processed condensate. Field condensate is produced near the wellhead by running the gas stream through a stabilizer that removes the lighter, more volatile elements. Although definitions vary throughout the industry, condensate generally exhibits an American Petroleum Institute (API) gravity of more than 50 degrees. The shale oil and gas revolution has enabled the US to overtake Russia as the world’s leading natural-gas producer and grow its oil production for the first time in decades. Condensate volumes have also surged, especially in the Eagle Ford Shale. The Utica Shale in Ohio also contains a condensate window, while recent comments from producers in the Permian Basin have indicated that output from this play has come in lighter than expected. But US refineries aren’t optimized to produce gasoline and diesel fuel from this ultralight feedstock. Before the shale oil and gas revolution took root, downstream operators invested huge sums to improve their plants’ ability to process heavier crude oils that usually trade at a quality discount. Refiners have grappled with the rising proportion of condensate blended into their feedstock supply; some have even rejected oil deliveries for being too light. 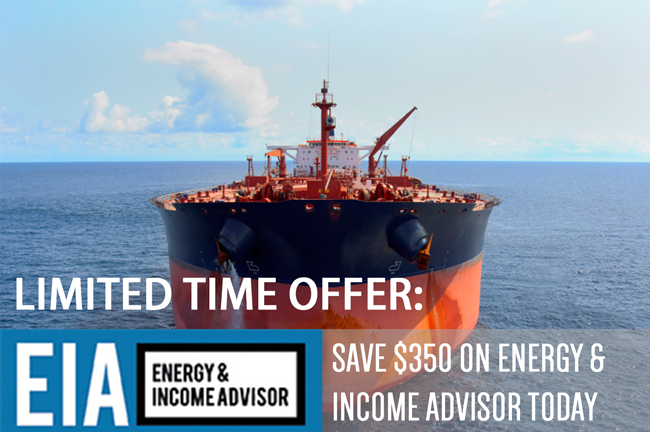 As a result, Gulf Coast condensate has traded at a discount to Brent and West Texas Intermediate crude oils. Prior to the PLRs issued by the BIS, the market had assumed that prospective exporters would at least need to process the condensate through a splitter–a simplified distillation tower that separates the condensate into more valuable components such as NGLs, naphtha and distillates. When news of the PLRs broke, the blue-chip MLP’s strategy became abundantly clear; rather than build a splitter, the partnership found a loophole in the existing US law that could lower the level of capital investment needed to process condensate for export. The exact terms and conditions of the PLRs remain confidential; however, Enterprise Products Partners’ ingenuity appears to have given the firm a leg up on the competition once again. In fact, the BIS shut the door on additional PLRs related condensate exports when it reportedly “held without action” a flood of similar requests from other firms. 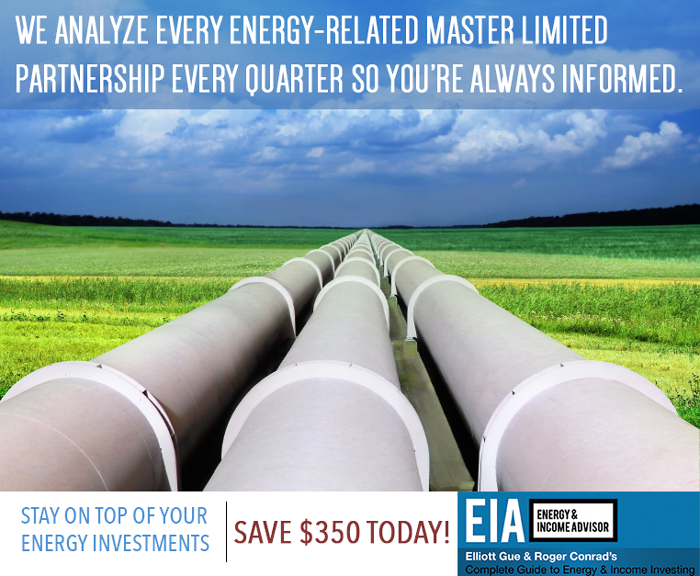 In short, Enterprise Products Partners is a great company and deservedly remains among the most admired firms in the midstream energy business by both industry participants and investors. The stock has been one of our favorites over the years and has made a great deal of money for our subscribers. But investors should stand aside and wait for a pullback before adding to or establishing a position in the name. The problem with Enterprise Products Partners right now is valuation. 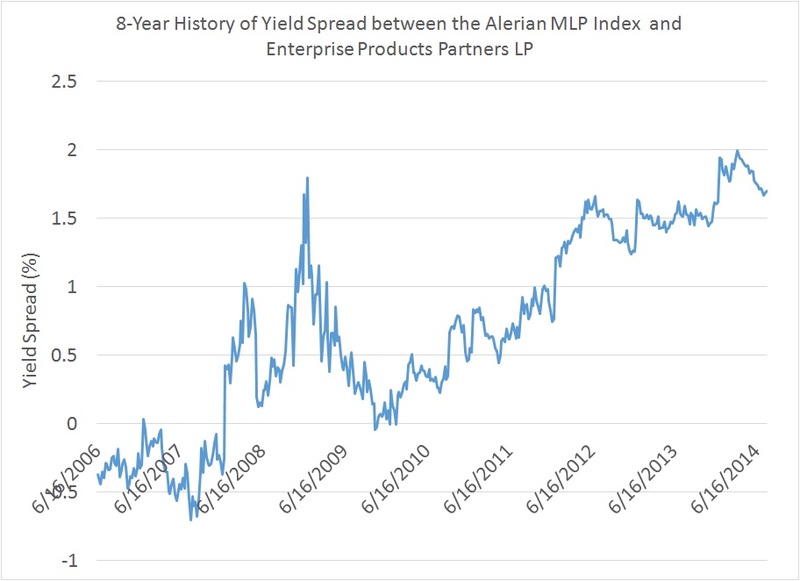 Today, the Alerian MLP Index sports a distribution yield of 5.6 percent–roughly 170 basis points more than the current return offered by Enterprise Products Partners. Given Enterprise Products Partners’ track record of success, solid balance sheet and impressive asset base with built-in growth opportunities, the stock should have a lower distribution yield than the Alerian MLP Index. However, the current yield spread is more than twice the historical average of about 70 basis points. Financial journalists and media pundits are fascinated by the concept of absolute valuation, especially after a prolonged rally in the stock market. Using metrics like price to earnings (P/E) or enterprise value to EBITDA, they attempt to divine whether the S&P 500 is cheap or expensive relative to historical norms. Unfortunately, there are almost as many valuation measures as there are financial pundits. Although the absolute valuation of the Alerian MLP Index provides ample fodder for pundits, investors should look to relative valuations to identify favorably priced names in this security class that could outperform the broader market. Yield and distribution growth are the main ingredients of MLP valuations. To tempt investors, MLPs with little or no growth potential must offer a higher yield. In contrast, MLPs with a large slate of organic growth projects or the potential to purchase assets from their general partners (drop-down acquisitions) often sport lower yields. Any valuation framework is a rough guide to an inefficient market; however, this graph plotting indicated yield and the Bloomberg consensus estimate for three-year distribution growth serves as a good starting point. The thick blue line on the graph represents a best-fit curve between yield and anticipated distribution growth for 45 MLPs. Yield and growth expectations exhibit a tight correlation, and most MLPs included in the study hew closely to the line. MLPs located above the thick blue line appear relatively cheap; these names offer higher yields and the potential for solid distribution growth. Meanwhile, MLPs below the line are relatively expensive on the basis of yield and growth potential. Investors shouldn’t invest blindly in the “cheap” MLPs on this graph. In some cases, these stocks trade at a discount for good reason. However, this simple valuation exercise can unearth gems that the market has overlooked in its fervor for larger, established names. Enterprise Products Partners’ yield and the Bloomberg consensus estimate for the MLP’s three-year distribution growth place it well below the best-fit curve on our graph, suggesting that the firm is overvalued. The consensus estimate calls for the MLP to grow its distribution at an average annual rate of 6.4 percent–a slight improvement from its 5.7 percent run rate over the past three years. Meanwhile, the stock offers an indicated yield of less than 4 percent. In comparison, Wall Street analysts expect Kinder Morgan Energy Partners LP (NYSE: KMP) to boost its payout at an average annual rate of 8.8 percent. Nevertheless, this large-capitalization MLP’s stock sports a distribution yield of almost 7 percent–more than 300 basis points higher than Enterprise Products Partners’ current return. This valuation gap reflects Kinder Morgan Energy Partners’ tighter distribution growth and onerous incentive distribution rates, which raise its cost of capital and eat into returns on its growth projects. That being said, suggesting that investors sell Enterprise Products Partners would be downright irresponsible. Investors who have held this stock over the years and sit on significant returns (I count myself in this fortunate group) face a deferred tax liability that isn’t activated until the position is sold. And although Enterprise Products Partners’ valuation appears frothy at these levels, the MLP’s growth prospects haven’t dimmed in the slightest.